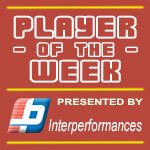 31-year old forward Dior Lowhorn (201-F-87) had a very impressive game in the last round for Satria Muda and receives a Interperformances Player of the Week award for round 10. He had a double-double of 30 points and 12 rebounds, while his team beat Bima Perkasa (#5, 3-5) 73-62. Thanks to this victory Satria Muda moved-up to the 3rd position in their group in Indonesian league. They would have been even better if they hadn't lost a few games earlier this season. Satria Muda will need more victories to improve their 4-3 record. In the team's last game Lowhorn had a remarkable 75.0% from 2-point range. It's his second year at Satria Muda and it's hard to imagine this team without him. University of San Francisco graduate has very impressive stats this year. Lowhorn is in league's top in points (3rd best: 23.3ppg) and averages solid 66.7% FGP and 71.4% from behind 3-point line. Second best performed player last round was Michael Vigilance (203-F-94) of Siliwangi. 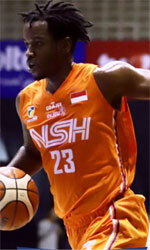 He is American forward in his first season at Siliwangi. In the last game Vigilance recorded impressive double-double of 24 points and 22 rebounds. Bad luck as Siliwangi lost that game 63-77 to the higher-ranked NSH (#1, 6-3). It was definitely game of the week between two contenders to the top position in Red Group. Siliwangi still maintains its place in the top 4 of the standings, even despite this loss. His team is not often considered as one of the league's best with a mere 3-6 record. Vigilance is a newcomer at Siliwangi and quickly became one of team's most reliable players. Former Clark Atlanta University star Vigilance is a former Eurobasket Summer League player, which is considered top international summer league in the market. Third place about best performers goes to guard Wayne Bradford (193-G-92) of league's second-best Pelita Jaya. Bradford got into 30-points club by scoring 35 points in the last round. He went also for eleven rebounds . He was a key player of Pelita Jaya, leading his team to a 70-63 win against #2 ranked Hang Tuah. Pelita Jaya needs these victories very badly if they think about taking over top position in Red Group. Their record at this point is 4 victories and 3 lost games. Bradford has a great season in Indonesia. After only 2 games, he made it on the list of the league's leaders in points with 30.5ppg (7th best).